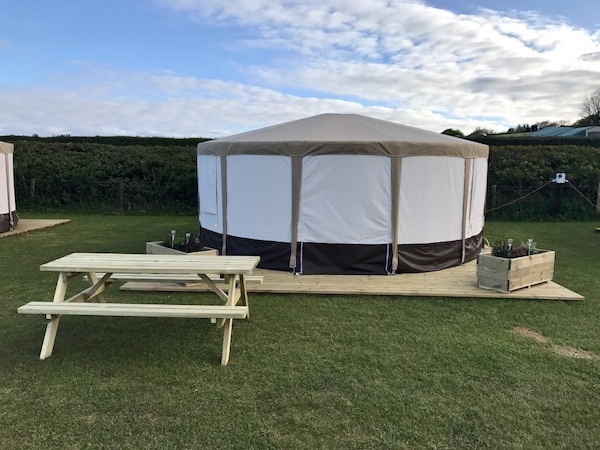 Updated for 2018, Glamping Tents are now again available at the award winning Three Cliffs Bay. 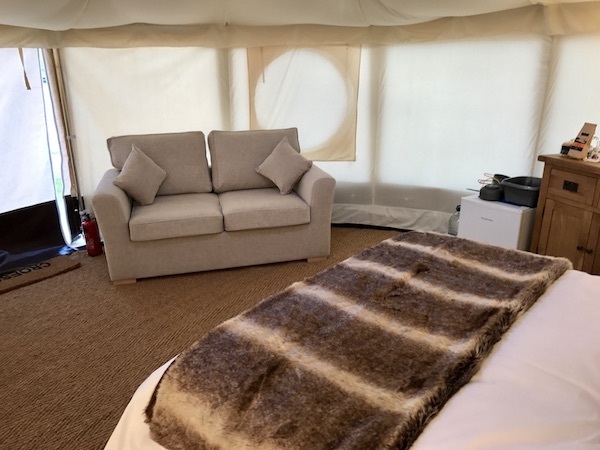 Enjoy the luxury side of camping in one of our modern Glamping Tents, just a short walk from the beach.These spacious and luxurious new Glamping Tents sleep up to 5 comfortably, and infants are more than welcome in our provided travel cots and high chairs. All Glamping Tents are also dog friendly, so the whole family can enjoy. 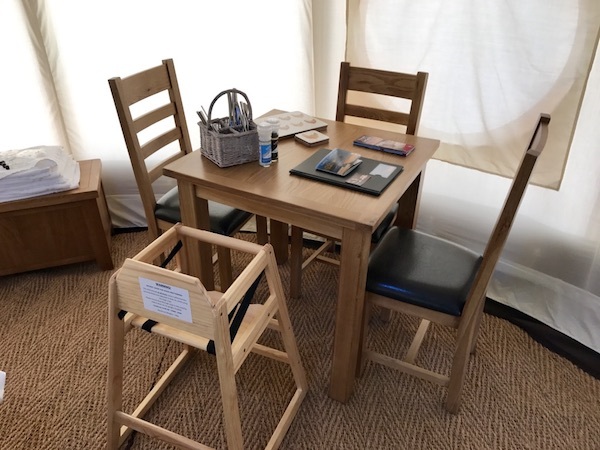 Electric is provided to each tent as well as all the usual lights, sockets and small convenience fridge for your weekend away.Glamping is all about luxury, and making camping easier. 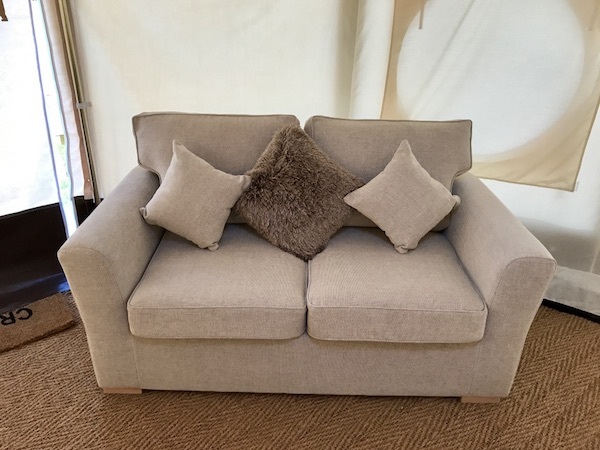 All bed linen and towels are ready for you upon arrival in the tent. We will also be offering luxury hampers to enjoy with your stay. 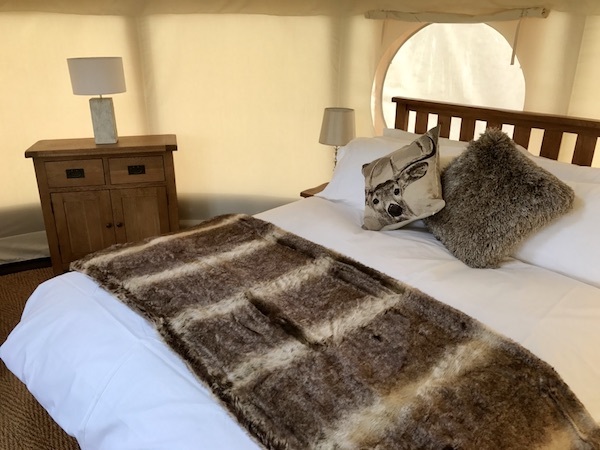 These spacious and luxurious new Glamping Tents sleep up to 5 comfortably, and infants are more than welcome in our provided travel cots and high chairs. All tents are also dog friendly, so the whole family can enjoy. Electric is provided to each tent as well as all the usual lights, sockets and small convenience fridge for your weekend away. Glamping is all about luxury, and making camping easier. All bed linen and towels are ready for you upon arrival in the tent. We will also be offering luxury hampers to enjoy with your stay. 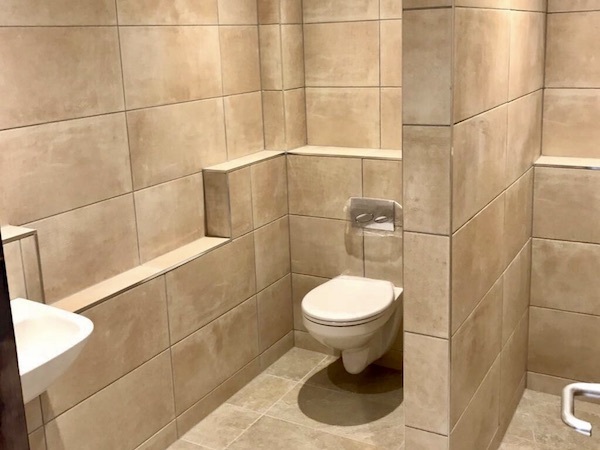 Our yurts are a small walk away from our brand new, modern and spacious toilet facilities, featuring en-suite style bathrooms with heated mirror, touchless shower controls, washbasin and toilet as well as underfloor heating. Just perfect for those cooler mornings. This season including a fire pit with your Glamping Tent for free! If you would like to use the fire pit, we have starter kits available from £7.50 which includes logs, fire lighters and matches. These can also be brought over to your pitch ready to get started. We have a wide range of luxury hampers available to you upon arrival. These start at only £12.00. If you would like to add one, then just let us know. 53% of our Glamping guests in 2018 booked a Hamper with us! Q. Are the yurts heated? Yes! 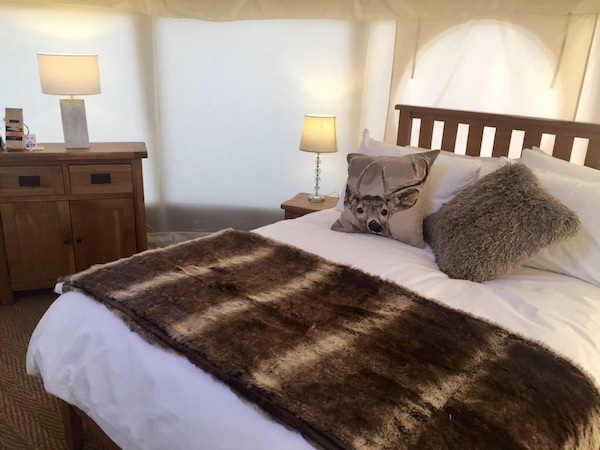 All of our Glamping tents are well insulated and have heaters ready inside. We are also including a free external Fire Pit free of charge for those cooler evenings. Q. When do you open? 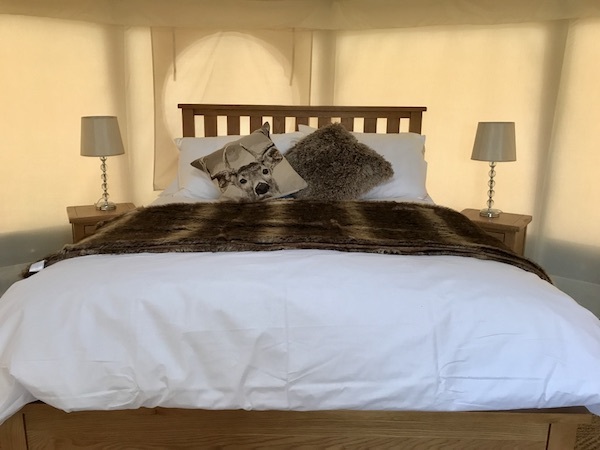 The Glamping Tents are updated for 2019, and open 1st April 2019 and close at the end of our season in November. Q. When can I book? You can book anytime online, or phone us on 01792 371218 to book by phone. Yes! All our glamping tents accept dogs. They are also allowed on the beach 12 months a year. Your tent is available from 4pm on your day of arrival, and must be vacated by 10am on your departure date. Q. Am I entitled to a refund when cancelling? No, all payments are final and non-refundable. We can change your booking dates up to 14 days before arrival. Q. Do the glamping tents have a sea view? No, but they are only a short walk from the sea view areas. The beach is also only a short walk from the site. Q. How large is the yurt? Our yurts are 5m diameter, and sleep up to 5 people (and are also dog and infant friendly). Q. What about cooking facilities? Each of our yurts have their own private BBQ and gas stove just outside the tent. All crockery, plates, cutlery and pots/pans are included as well as stove kettle. Q. What is the bed arrangement? 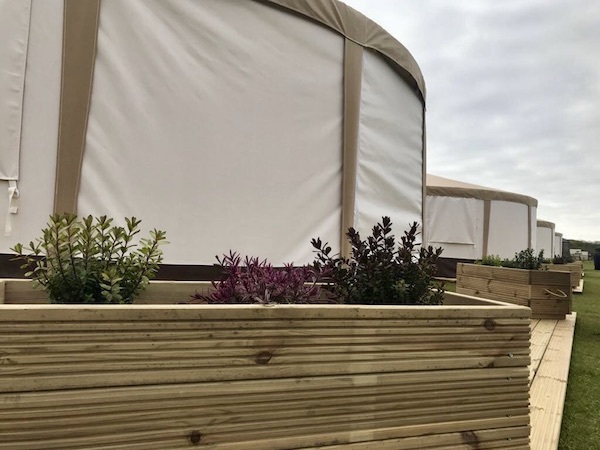 Each of our yurts have a wooden double bed, a double sofa bed and a travel cot for your use. All bedding is provided for the main and sofa bed, but not the travel cot. If you require extra bedding for a fifth guest, we have a fold out camp bed and sleeping bag available for use. There is a minimum stay of 3 nights over school holidays and bank holidays, and a 2 night minimum over weekends at busier times. All prices include up to a family of 5 (please check with us regarding all-adult groups). All bed linen and towels are included, as well as use of a cot and high chair for infants (please request when booking). High season covers May Day weekend, the Spring Bank Holiday week and from 1st July until the first week in September. Medium season covers May, June, and mid September until the end of September. We love guests bringing their dogs with them, but there is a small £25.00 charge for dogs in the glamping tents. You can bring up to 2 dogs (but still only £25.00 total charge). Upon arrival, there is a security deposit required which will be refunded within 48 hours of your departure. Please contact us to confirm this amount.